After the loss of friends and comrades, after betrayal and battle, master thief Shadow Harold finally enters Hrad Spein - the dreaded underground complex where the object of Harold's quest, the Rainbow Horn, is hidden. With nothing more than his wits, the advice of a goblin shaman, and a stolen map, he must succeed where battalions of soldiers and wizards have failed. On top of that, Harold must outwit an enemy within Hrad Spein who is working with a powerful sorceress in an attempt to find the Horn before he does. Before the master thief are many dangerous obstacles - including ghouls, long-dead armies of elves, orcs, and magical traps...and, he is sure, even more deadly obstacles that are yet unknown. Will Shadow Harold be able to pull off the greatest theft in history? Unfortunately, even if he does, he'll not be home free. The Forest of Zagrabia, through which Harold must make his way home, is controlled by the armies of orcs that have come to join The Nameless One. For the first time in centuries, they have united into a vast army about to cut a bloody swath through the lands of men. Another huge army collected by The Nameless One has already begun the titanic battle with King Stalkon, and the ï¬nal war has begun, bringing bleak days of despair and devastation. Harold will have to use all his guile, cunning, and luck to find a way to escape the Labyrinth and get to Avendoom in time to save his world from destruction. Alexey Pehov is an exciting new-generation talent whose fantasies have gained him a large and still rapidly increasing fan base in his native Russia. 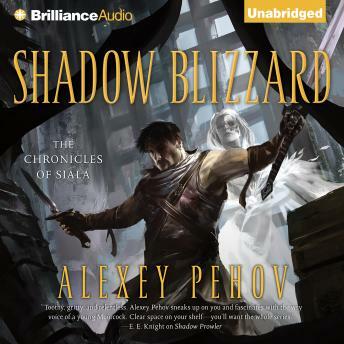 In 2002, the complete Chronicles of Siala (comprised of Shadow Prowler, Shadow Chaser, and Shadow Blizzard) was awarded the Russian fantasy community's highest professional honor, the Silver Kaduzei.